Television advertising has always been the most dominant form of video advertising, and will be for years to come. However, online video advertising is also becoming more popular according to Forbes. Sites like Facebook, with nearly 1 billion users each day, are seeing static banner ads replaced with video ads. But Facebook isn’t the only site, trends like this are popping up all over the market. The power of online video advertising is growing so quickly because of its ability to reach target audiences and accurately measure the results. For over a decade Red Crow has been a nimble organization in the marketing and advertising industry, constantly readjusting our services and strategies to fit the needs of clients and the rapidly changing market. With the growing demand for video, both online and on television, we’ve kept one of our main areas of expertise on video production. Red Crow offers a variety of video production services including television ads, animations, educational videos, testimonials, product presentation videos and video production for websites and online content. Through tactical research we are able to help you make informed decision about which production services are right for your business. One of the best things about choosing Red Crow for your video production is we handle everything from start to finish including concepting, scripting, casting, directing, filming and editing. Our team of professionals have the experience and expertise to make sure the process goes smoothly for all parties involved, which helps you save time and money on production costs. Whether you choose to use our 4,800 square foot studio with full HD video production and audio recording or have our team on site for shooting, Red Crow makes sure the day fits around your schedule and specifications. With marketing strategies constantly changing and improving, your company’s next advertising planning session should include a discussion about increasing your digital video presence. Your audience and customers are now using mobile devices that offer killer video quality, its time to capitalize on it. 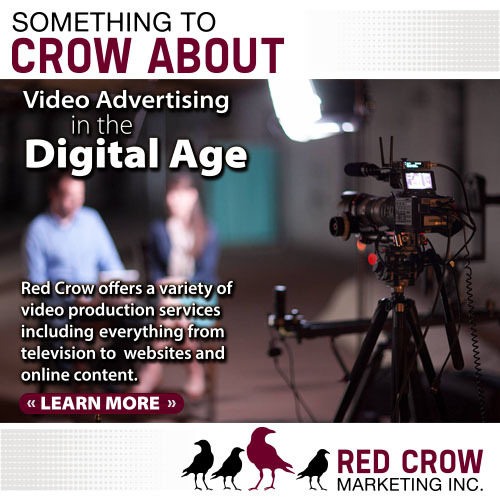 Contact Red Crow Marketing today to build your digital video plan and move your advertising to the next level.